This badge was issued to Haden Watne on 07 Mar 2016. 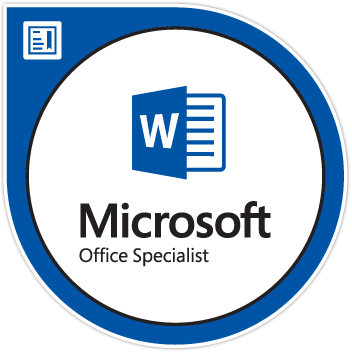 Microsoft Word 2013 Certification exam earners have a fundamental understanding of the Word environment and the ability to complete tasks independently. Earners demonstrated the principal features of Word 2013 by creating and editing a large project which can include professional-looking reports, multi-column newsletters, résumés, and business correspondence. Earners may include students, business information workers, clerical workers, educators, and others.